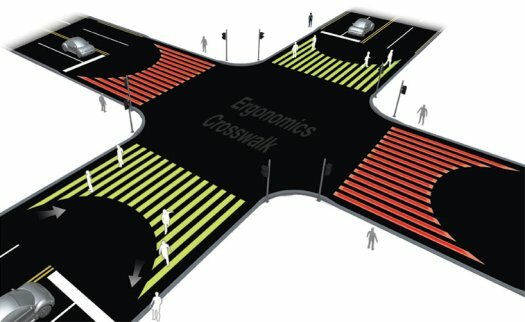 Interesting idea that follows the desire lines of pedestrians. 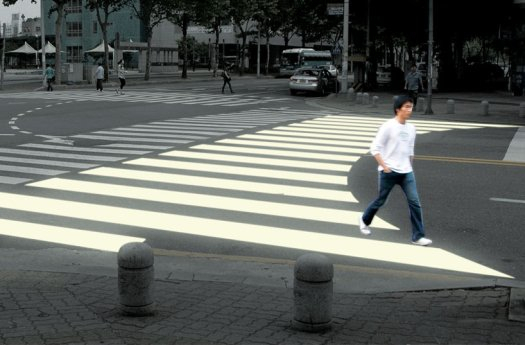 This Ergo Crosswalk is the brainchild of Korean designer Jae Min Lim. His idea was shortlisted at the Seoul Design Competition. The stop lines for cars are pushed back to allow for a safe buffer zone. In addition, the design idea includes using not paint for the stripes but rather led lights that flash red or green. That last bit is a bit extreme. I doubt our cities need more flashy eye pollution, but that doesn't make the idea any less cool. Here's more on Desire Lines relating to Copenhagen cyclists.